Background: Numerous studies have demonstrated that daphnetin (DAP) has anti-inflammatory, antioxidant, antibacterial, antitumor, anti-arthritic, and other extensive pharmacological effects. However, its genotoxicity has rarely been examined. Materials and Methods: The safety of DAP was evaluated by an acute toxicity test using a Salmonella typhimurium/mammalian microsomal enzyme assay (Ames test), bone marrow micronucleus test, acute skin allergy test, and local mucosal irritation test. Results: Mice received a dose of 100 mg/kg body weight through lavage, which is more than 175 times the whole-body effective dose and were continuously observed for 14 d; mice showed no signs of poisoning. In the Ames test, each dose of DAP resulted in numbers of revertant colonies that were <2 two times the number of mutation colonies in the negative control group, indicating a negative result. The micronucleus rate of each DAP dose group was not significantly different from that of the negative control group (P > 0.05) but was significantly different from that of the cyclophosphamide (CTX)-positive control group (P < 0.05). Rabbit skin showed no stimulation reaction to DAP or 10% dimethyl sulfoxide (DMSO), including no erythema, edema, or sensitization phenomena. Rabbits were generally in good condition after dosing the oral mucosa with DAP, and no oral mucosal erythema, erosion, ulcers, or other irritation reactions were observed. Conclusions: Within the range of tested doses, DAP did not cause any observed toxic effects, mutagenic effects, sensitization, or stimulation. Abbreviations used: DAP: Daphnetin, CTX: Cyclophosphamide, DMSO: Dimethyl sulfoxide, CIA: Collagen-induced arthritis, PCB: Polychlorinated biphenyl, NS: Normal saline, PCE: Polychromatic erythrocyte, NCE: Normochromatic erythrocyte; LD50: The median lethal dose. DAP is nonallergenic to oral mucosa and does not produce irritating reactions. An important component of Daphne odora var. marginata extracts, daphnetin (DAP), 7,8-dihydroxycoumarin, is a coumarin derivative that is normally an odorless and tasteless white or off-white powder that is slightly soluble in ethanol and insoluble in water. D. marginata originated in China, mainly in the South of the Yangtze River basin; the scale at which this species is planted is the largest in Dayu County (Jiangxi Province), where growing this plant is a key local industry. The active ingredients of D. marginata mainly include coumarin, flavonoids, and lignans, which act as the active components leading to the plant's anti-inflammatory analgesic effect. Numerous studies have demonstrated that DAP has anti-inflammatory, antioxidant, antibacterial, antitumor, and anti-arthritic effects. Our previous study found that DAP exerts a good therapeutic effect on collagen-induced arthritis (CIA) in rats by regulating the balance of Th17/Treg cells, inhibiting the autoimmune and inflammatory response to improve the symptoms of CIA., In addition, DAP can reduce methylation and subsequently increase the expression of proapoptotic genes in the synovial cells involved in CIA. However, research on the safety of DAP has rarely been reported, therefore, to provide a more comprehensive basis for experiments that test the use of DAP, we carried out relevant toxicology tests on this important coumarin derivative. Drug toxicology testing is a comprehensive approach to evaluate the toxic effects of drugs on the body in terms of the severity and frequency of occurrence of the harmful effects, the dose-response (effect) relationship, and the ability of the drug to cause a toxic reaction in an organism. This testing provides the basis for preventing and controlling harmful effects and determining the safety and/or toxicity of drugs. This study used the maximum-dosage tests to evaluate the acute toxicity of DAP, Ames tests to evaluate its mutagenicity, bone marrow micronucleus tests to evaluate its genotoxicity, and skin sensitization and oral stimulation tests to determine its sensitization and irritation. These allowed for a comprehensive safety evaluation of DAP. SPF ICR mice and clean, live suckling SD mice were provided by the Laboratory Animal facility of Shanghai Super-B and K laboratory animal Corp., Ltd. Twenty-four healthy rabbits (2.5 kg on average, half male and half female, no pregnant females) were provided by the Nanchang University Animal Science department. All experimental animals were observed for 3 d before the test. The experimental animal breeding environment was 22°C–23°C, with a humidity of 50%–68%. DAP (a monomeric compound, with >99.4% purity) was isolated from D. marginata extract by the Tauto Biotech Co., Ltd., (Shanghai, China) and a molecular mass of 178 was determined by the Analysis and Testing Center in Jiangxi Province. Forty male and female mice were evenly and randomly divided into two groups, a control group and experimental group, after fasting overnight. A solution of DAP was prepared at a final concentration of 5 mg/ml. The maximum-dosage method was used to directly lavage the experimental mice at a feeding capacity of 20 ml/kg body weight, that is, 100 mg/kg body weight. The mice were continuously observed for 14 d, noting changes in their skin, color, eyes, mucous membrane, breathing, circulation, and central nervous system function; deaths and symptoms of poisoning were recorded, and the mice were autopsied after death. Solutions of DAP were prepared at final concentrations of 8, 40, 200, 1000, and 5000 μg/dish for the dosed groups; there was also a negative control group and a positive control group. According to genotype, the biological factors needed to meet the requirements of Salmonella typhimurium histidine-deficient TA97, TA98, TA100, and TA102 strains were identified. An in vitro metabolic activation system was based on polychlorinated biphenyl-induced rat liver homogenates. First, 0.1 ml of the test-strain-enrichment broth and drug solution and 0.5 ml of the S9 mixture were added to the top agar plate and mixed into the underlying medium plate. After heating at 37°C for 48 h, the number of revertant colonies per dish was calculated. Thirty male and female mice were randomly divided into three groups. Solutions of DAP were prepared at final concentrations of 0.75, 1.5, and 3 mg/ml. Using an oral gavage method with 30 h of exposure, 20 ml/kg body weight of the DAP solutions were fed to the mice, corresponding to 15, 30, and 60 mg/kg body weight; cyclophosphamide (CTX) was used for the positive control group and normal saline (NS) was used for the negative control group. Lavaging occurred at 0 and 24 h and the mice were sacrificed by cervical dislocation at the last lavage. After 6 h, both femurs were clipped, and a smear from the cut end was diluted with calf serum, followed by Giemsa staining after fixation in methanol. For each mouse, up to 1000 polychromatic erythrocytes (PCEs) were counted under a microscope, and the number of micronucleated PCEs was counted among 200 PCEs (mature red blood cells) within the field of view; the PCE/normochromatic erythrocyte (NCE) ratio and micronucleus rate were then calculated. Solutions of DAP were prepared at a final concentration of 4 mg/ml, and analytically pure dimethyl sulfoxide (DMSO) was diluted with distilled water to a 10% solution. A 2-cm diameter piece of disinfection filter paper was dropped into a mixture of 0.5 ml of saline, a 10% DMSO solution, and the DAP solution. Twelve healthy rabbits were randomly divided into an NS group, a 10% DMSO group, and a DAP group. The backs of the rabbits were shaved on both sides of the spine (2.5 cm × 2.5 cm area), taking care not to damage the skin, and the area was gently wiped clean with warm water. A piece of filter paper was used for each group (NS, DMSO, or DAP according to the label) and was affixed onto the hair of the 12 rabbits at the skin, which was then covered with a layer of greaseproof paper and two layers of gauze and finally closed with nonirritating tape. The residual liquid was removed with physiological saline after 6 h; the skin of each rabbit was checked for reactions to the stimulation at 1 h, 24 h, 48 h, 72 h, and 7 d, and the skin test area was excised and prepared as routine paraffin-embedded sections and stained with HE. DAP was prepared as before. Twelve healthy rabbits were randomly divided into an NS group, a 10% DMSO group, and a DAP group. A small cotton ball 5 mm in diameter that was fully saturated with the test solution was placed on the right side of the palatal mucosa of the rabbits for 15 min each morning and evening. Care was taken to not damage the mucous membrane, and the change in the contact area was observed at 1 h, 24 h, and 7 d. The control site and experimental sites of the palatal mucosa were assessed after the animals were sacrificed, and the areas were excised and prepared as routine paraffin-embedded sections and stained with HE. Our previous study estimated the effective dose of DAP in the human body to be 0.57 mg/kg. The mice were exposed to more than 175 times the body effective dose of 100 mg/kg body weight through lavage and were continuously observed for 14 d with no signs of poisoning. After the end of the experiment, all the animals were sacrificed and their gross anatomy was examined. These results confirm that the maximum dosage for oral toxicity of DAP in mice is >100 mg/kg body weight. Four strains of S. typhimurium (TA97, TA98, TA100, and TA102) were tested with or without the added S9 activation system. At each dose of DAP, the number of revertant colonies was <2 times the number of mutated colonies in the negative control group. No genetic toxicity or dose-response relationship was observed, indicating that the DAP Ames test was negative [Data in [Table 1] and [Figure 1]. The micronucleus rate for each DAP test dose group was not significantly different from the rate for the negative control group (P > 0.05) but was significantly different from the rate for the CTX positive control group (P < 0.05). The PCE/NCE values were between 1.0 and 1.3, and the results were negative [Figure 2], indicating that DAP had no effect on mouse bone marrow cells or showed any genotoxicity under our experimental conditions. A normal red cell morphology in the micronucleus test is shown in [Figure 2]. After removal of the residual liquid by physiological saline followed by continuous observation for 7 d, the skin of the rabbits showed no stimulation reactions to DAP or 10% DMSO, that is, no erythema or edema, and the animals did not display any sensitization phenomena. According to the allergic skin reaction rating criteria in the 2011 edition of the People's Health Publishing House “Research Methods in Pharmacology of Chinese Medica,” the sensitization rates were lower than 10%. Therefore, DAP is nonallergenic and does not produce allergic reactions. HE-stained tissue biopsies of the rabbit skin allergy test sites are shown in [Figure 3]. 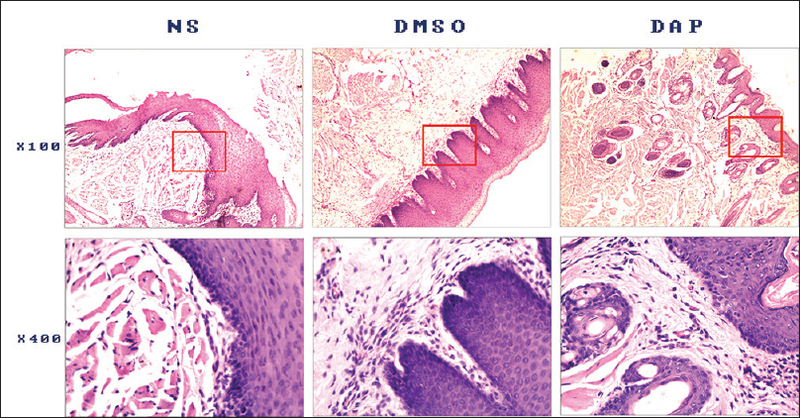 The rabbits were generally in good condition after exposing their oral mucosa to DAP; no oral mucosal erythema, erosion, ulcers, or other oral mucosal irritation reactions were observed. According to the allergic skin reaction rating criteria in the 2011 edition of the People's Health Publishing House “Research Methods in Pharmacology of Chinese Medica,” there was a <10% incidence of sensitization. Therefore, DAP is nonallergenic to oral mucosa and does not produce irritating reactions. 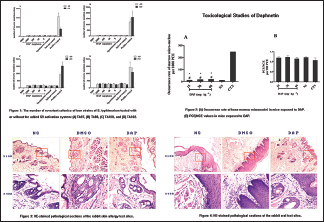 HE-stained pathological sections of the rabbit oral test sites are shown in [Figure 4]. In recent years, effective active ingredients in herbal extracts from natural medicine have become a hot topic in new drug research and development. In traditional Chinese medicine, active ingredients such as coumarin, flavonoids,, Hook,, and Sinomenine have good anti-inflammatory and antitumor pharmacological effects. DAP is a typical monomeric active ingredient of the coumarin class of compounds. Many studies have investigated the pharmacological activity of DAP, but research on the toxicology of this compound has been lacking. To facilitate more comprehensive development and utilization of DAP and predict its potential threat to humans, this study subjected DAP to systematic toxicological tests and evaluated its safety. Acute toxicity testing exposes animals once or several times within 24 h to a certain dose of a drug, and the toxicity-related reactions are evaluated over a certain period. As one of the main tools of pharmaceutical toxicology research, acute toxicity testing is often the first step in preclinical toxicology studies of new drugs. When the test substance is of low toxicity or the median lethal dose (LD50) cannot be measured due to dose limitations, the results can provide the maximum dose to assess the safety of the drug., In our previous research, we estimated the effective dose of DAP in the human body to be 0.57 mg/kg. Mice that were fed a one-time dose of 100 mg/kg body weight, which is more than 175 times the effective dose, and were then continuously observed for 14 d. Mice showed no signs of poisoning and had normal weight gain. These observations essentially reflect the broader safety of DAP and indicate no short-term toxicity. Genetic toxicity studies are an important part of the evaluation of drug safety to predict unknown potential genetic toxicity or carcinogenicity. Mutations are changes in genetic material and can be caused by a drug; these include genetic mutations and chromosomal aberrations. Point mutations are changes in one or more genes that make up a chromosome that cannot be directly visualized by light microscopy. The Ames test is a widely employed method that uses bacteria to test whether a given chemical can cause mutations in the DNA of the test organism. The test uses a number of Salmonella strains with preexisting mutations that leave the bacteria unable to synthesize a required amino acid, histidine, and therefore, unable to grow and form colonies in its absence. Salmonella strains TA97, TA98, TA100, and TA102 were used in this study. Plate incorporation was used for the DAP Ames test. In the Ames test, the ratio of the average number of colonies of the same dose in each dish to the mean number of spontaneous colonies in each negative control dish was referred to as MR. When the MR value was 2 or higher, there was a dose-response relationship with a normal background, and the plate was judged as mutagen-positive.,, In this study, the S. typhimurium test strains TA97, TA98, TA100, and TA102, with or without the added S9 activation system and at each dose of DAP, resulted in MR values of less than 2; no dose-response relationship was obtained, and the Ames test results were negative, indicating that DAP has no mutagenic effect. In addition, the high-dose DAP group (5000 μg/dish) had significantly fewer mutated colonies of each test strain than the control group. Thus, the high dose of DAP significantly inhibited the growth of the Salmonella strains, which was also reported by Cottigli, who confirmed that DAP is an iron chelator that can act on the iron-containing enzymes of microorganisms such as bacteria, causing selective “iron-starvation,” thus affecting microbial metabolism and inhibiting or killing the microorganisms. There are many ways to study the chromosomal aberrations induced by drugs in mammals. The micronucleus test is widely used in genotoxicity studies because of its simplicity, quickness, and sensitivity. A micronucleus is a manifestation of chromosomal damage, evolving from fragments or rings that have experienced chromosomal breaks. A micronucleus test is used in toxicological screening for potential genotoxic compounds. This assay is now recognized as one of the most successful and reliable assays for genotoxic carcinogens. PCEs in anaphase are red blood cells present during childhood development. At the mature stage, the nucleus of red blood cells is discharged and the cytoplasm contains ribosomes. When Giemsa staining turns erythrocytes a gray-blue color, the cells are mature; when the cells are dyed pale orange, the stored ribose has disappeared. The number of PCEs with a micronucleus in the bone marrow is easier to determine than the spontaneous micronucleus rate; therefore, the bone marrow PCE micronucleus test is preferred for assessing the cell population., The micronucleus rate calculation takes into account the ratio of PCEs and NCEs among 200 cells, which can be used as an indicator of cytotoxicity. A result of <0.1 indicates that the formation of PCEs was strongly inhibited, and a result of <0.05 indicates an overdose and unreliable results. A PCE/NCE ratio >1.0 indicates a reliable result. If the test substance increases the micronucleus rate in a dose-dependent manner or if some dose groups show significantly higher reproducibility at a specific test point, the micronucleus test is positive. The micronucleus rate of each DAP test dose group was not significantly different (P > 0.05) from the rate of the negative control group but was significantly different from the rate of the CTX (positive control group (P < 0.05). The results were negative, indicating that DAP had no effect on mouse bone marrow cells and showed no genotoxicity under our experimental conditions. Drugs must primarily exert a pharmacological effect from the oral or external application. Evaluating the safety of drug application to the oral mucosa and skin is therefore particularly important., Rabbits are a commonly used animal model because of their large surface area and their mouth area, which are easy to manipulate, as well as their high sensitivity to external stimuli. Therefore, this study used rabbits as subjects to test the effects of BAP on skin sensitization and oral stimulation. DAP must be dissolved in DMSO before application, and DMSO also has some toxicity that may affect the test results. Therefore, in addition to the experimental control groups and the DAP groups; a 10% DMSO group was simultaneously tested to ensure the reliability of the results. A concentration of 10% is much higher than the concentration of DMSO used to dissolve DAP. DAP and 10% DMSO had no stimulating effect on the rabbits, including no erythema, edema, or systemic sensitization phenomena. In the pathological examination of the rabbit skin test sites, microscopic inspection also revealed no significant inflammation or tissue damage. The sensitization score and sensitization rate were determined for DAP and indicated that this drug is nonallergenic and does not produce allergic reactions. After the rabbits' oral mucosa were continuous treated with DAP for 7 d, the rabbits were generally in good condition, and the oral mucosa was not congested or eroded, with no ulcers or other oral mucosal irritation reactions. The results for the DAP groups were not significantly different from those of the control group or the 10% DMSO group. 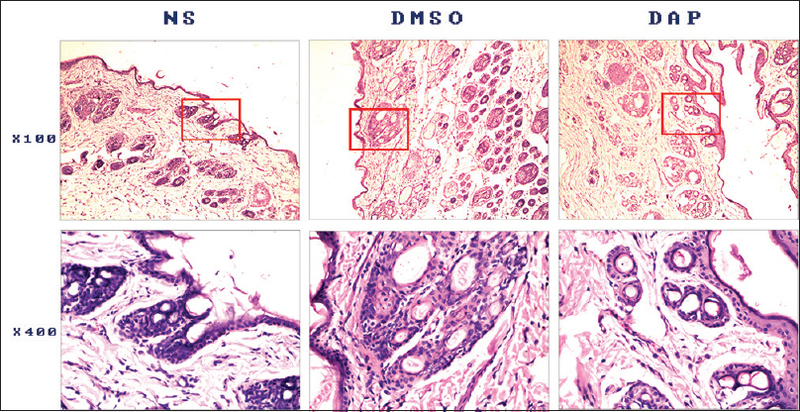 No epithelial morphological abnormalities were observed under the microscope and DMSO did not have a significant impact as a solvent for DAP in this study. DAP did not produce any irritation or allergic reactions on the skin or mucous membranes of rabbits in this study, indicating that DAP is safe for oral or topical administration and has no harmful pharmacological effects. In summary, the results of toxicological studies within the dose range tested here showed no obvious toxicity, mutagenic effects, allergenic effects, or mucosal irritation due to DAP, suggesting that DAP is a safe drug with broad application prospects and development value. This work described in this article was supported by the National Natural Science Foundation of China (No. 31460239). Riveiro ME, De Kimpe N, Moglioni A, Vázquez R, Monczor F, Shayo C, et al. Coumarins: Old compounds with novel promising therapeutic perspectives. Curr Med Chem 2010;17:1325-38. Venugopala KN, Rashmi V, Odhav B. Review on natural coumarin lead compounds for their pharmacological activity. Biomed Res Int 2013;2013:963248. Yu WW, Lu Z, Zhang H, Kang YH, Mao Y, Wang HH, et al. 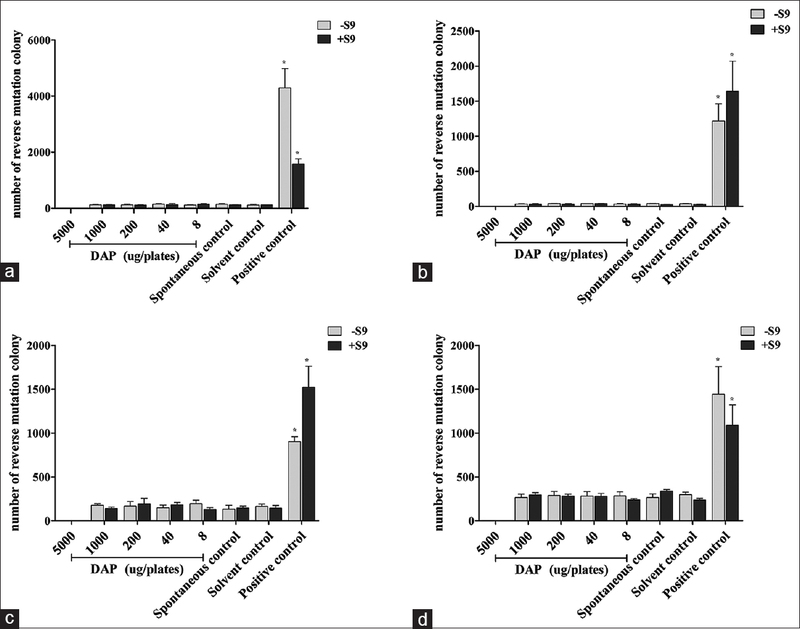 Anti-inflammatory and protective properties of daphnetin in endotoxin-induced lung injury. J Agric Food Chem 2014;62:12315-25. Yang L, Yang Q, Zhang K, Li YJ, Wu YM, Liu SB, et al. Neuroprotective effects of daphnetin against NMDA receptor-mediated excitotoxicity. Molecules 2014;19:14542-55. Huang F, Tang LH, Yu LQ, Ni YC, Wang QM, Nan FJ, et al. In vitro potentiation of antimalarial activities by daphnetin derivatives against plasmodium falciparum. Biomed Environ Sci 2006;19:367-70. Wang Y, Li CF, Pan LM, Gao ZL. 7,8-dihydroxycoumarin inhibits A549 human lung adenocarcinoma cell proliferation by inducing apoptosis via suppression of Akt/NF-κB signaling. Exp Ther Med 2013;5:1770-4. Gao Q, Shan J, Di L, Jiang L, Xu H. Therapeutic effects of daphnetin on adjuvant-induced arthritic rats. J Ethnopharmacol 2008;120:259-63. Yao R, Fu Y, Li S, Tu L, Zeng X, Kuang N, et al. Regulatory effect of daphnetin, a coumarin extracted from Daphne odora, on the balance of treg and Th17 in collagen-induced arthritis. Eur J Pharmacol 2011;670:286-94. Tu L, Li S, Fu Y, Yao R, Zhang Z, Yang S, et al. The therapeutic effects of daphnetin in collagen-induced arthritis involve its regulation of Th17 cells. Int Immunopharmacol 2012;13:417-23. Shu K, Kuang N, Zhang Z, Hu Z, Zhang Y, Fu Y, et al. Therapeutic effect of daphnetin on the autoimmune arthritis through demethylation of proapoptotic genes in synovial cells. J Transl Med 2014;12:287. Bloom JC, Brandt JT, Rice RH, Mauro TM, Fox DA, Boyes WK. Target organ toxicity. Casarett and Doull's toxicology: The basic science of poisons. In: Klaassen CD, editor. 7th ed. New York: McGraw-Hill; 2008. p. 453-807. Qi C. Research Methods in Pharmacology of Chinese Medica. Beijing: People's Health Publishing House; 2011. Peng XM, Damu GL, Zhou C. Current developments of coumarin compounds in medicinal chemistry. Curr Pharm Des 2013;19:3884-930. Cao H, Chen X, Jassbi AR, Xiao J. Microbial biotransformation of bioactive flavonoids. Biotechnol Adv 2015;33:214-23. Carletti G, Nervo G, Cattivelli L. Flavonoids and melanins: A common strategy across two kingdoms. Int J Biol Sci 2014;10:1159-70. Wong KF, Yuan Y, Luk JM. Tripterygium wilfordii bioactive compounds as anticancer and anti-inflammatory agents. Clin Exp Pharmacol Physiol 2012;39:311-20. Chen Y, Gong Z, Chen X, Tang L, Zhao X, Yuan Q, et al. Tripterygium wilfordii hook F (a traditional Chinese medicine) for primary nephrotic syndrome. Cochrane Database Syst Rev 2013;(8):CD008568. Wang Q, Li XK. Immunosuppressive and anti-inflammatory activities of sinomenine. Int Immunopharmacol 2011;11:373-6. Algandaby MM. Assessment of acute and subacute toxic effects of the Saudi folk herb retama raetam in rats. J Chin Med Assoc 2015;78:691-701. Anjum R, Krakat N, Toufiq Reza M, Klocke M. Assessment of mutagenic potential of pyrolysis biochars by Ames Salmonella/mammalian-microsomal mutagenicity test. Ecotoxicol Environ Saf 2014;107:306-12. Vinod V, Tiwari PK, Meshram GP. Evaluation of mutagenic and antimutagenic activities of neem (Azadirachta indica) seed oil in the in vitro Ames Salmonella/microsome assay and in vivo mouse bone marrow micronucleus test. J Ethnopharmacol 2011;134:931-7. Mortelmans K, Zeiger E. The Ames Salmonella/microsome mutagenicity assay. Mutat Res 2000;455:29-60. Akyıl D, Konuk M. Detection of genotoxicity and mutagenicity of chlorthiophos using micronucleus, chromosome aberration, sister chromatid exchange, and Ames tests. Environ Toxicol 2015;30:937-45. Akyil D, Konuk M, Eren Y, Liman R, Sağlam E. Mutagenic and genotoxic effects of anilofos with micronucleus, chromosome aberrations, sister chromatid exchanges and Ames test. Cytotechnology 2017;69:865-74. Cottiglia F, Loy G, Garau D, Floris C, Casu M, Pompei R, et al. Antimicrobial evaluation of coumarins and flavonoids from the stems of Daphne gnidium L. Phytomedicine 2001;8:302-5. Araldi RP, de Melo TC, Mendes TB, de Sá Júnior PL, Nozima BH, Ito ET, et al. Using the comet and micronucleus assays for genotoxicity studies: A review. Biomed Pharmacother 2015;72:74-82. Kitamoto S, Matsuyama R, Uematsu Y, Ogata K, Ota M, Yamada T, et al. Genotoxicity evaluation of benzene, di (2-ethylhexyl) phthalate, and trisodium ethylenediamine tetraacetic acid monohydrate using a combined rat comet/micronucleus assays. Mutat Res Genet Toxicol Environ Mutagen 2015;786-788:137-43. Moniczewski A, Librowski T, Lochyński S, Strub D. Evaluation of the irritating influence of carane derivatives and their antioxidant properties in a deoxyribose degradation test. Pharmacol Rep 2011;63:120-9. Fowles J, Lewis C, Rushton E. Studies on the environmental fate, ecotoxicology and toxicology of 2-methyl 1,3-propanediol. Regul Toxicol Pharmacol 2017;91:240-8. Vogel H. Drug Discovery and Evaluation: Pharmacological Assays. New York: Springer; 2007.